The Elephanta island was so named by the Portuguese, after the statue of an elephant near the landing area of the island. These rock cut temples dedicated to Shiva Mahadeva are rich in sculptural content. Motorboats take passengers from Appollo Bunder near the Gateway of India. .
How They were Constructed: This rock cut temples were created by carving out rock, and creating the columns, the internal spaces and the images. The entire temple is akin to a huge sculpture, through whose corridors and chambers one can walk. The entire complex was created through a process of rock removal. Some of the rock surfaces are highly finished while some are untreated bare rock. The entire cave temple complex covers an area of about 60000 squrare feet and it consists a main chamber and two lateral ones , courtyards and several subsidary shrines. Above the temple is the mass of natural rock. The enigmatic image of Trimurthi Sadasiva: The Sadasiva manifestation of Shiva is carved in relief at the end of the north south axis. This collossal 20 feet high image of the three headed Shiva, Trimurthy is a magnificient one, considered to be a masterpiece of Indian art. This colossal image represents Panchamukha Shiva, only three faces of whom are carved into the wall and it demands immediate attention upon entering the temple through the northern entrance. See All About Shiva for more information on Panchamukha Shiva. Also on the southern wall are grand sculptured images of Kalyanasundara, Gangadhara, Ardhanariswara and Uma Maheswara. To the west of the northern entrance are sculptured images of Nataraja and Andhakaasuravadamoorthy, and to its east are images of Yogiswara and Ravanaanugrahamurthy. 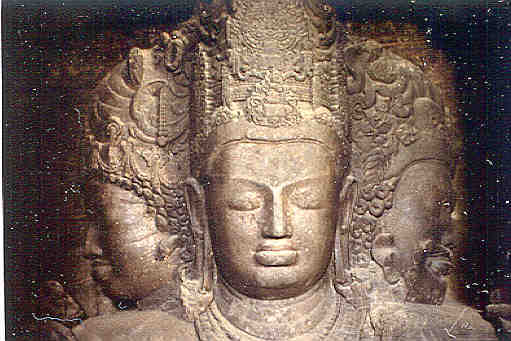 Thus in the Elephanta caves, Shiva is portrayed in the non anthropomorphic Shivalingam form, as well as in his quintessential being emanating from the Shivalingam in the colossal image, and in 8 manifest forms.